John Archer wonders if the UE55MU9000 finds a price/performance sweet spot in Samsung’s TV range. Read our Samsung UE55MU9000 Review. There’s much to like about Samsung’s new QLED TV technology – an ultra wide colour range, extreme brightness and uncanny ability to filter out ambient light are obvious positives – yet most people just won’t be in a position to invest in a QLED set. They’re high-performance TVs, priced accordingly. This is where Samsung’s MU9000 series comes in. This range appears – on paper, anyway – to deliver more or less the same specification as last year’s KS9000 series, but at a greatly reduced price. It therefore seems the 55in, 55MU9000 could be one of this year’s biggest high-quality bargains (there are 65in and 49in variants, too). Anyone who’s gawped at Samsung’s top-tier Q9F before moving down the pecking order to here will soon clock where some of the cash-saving comes from. While the ultra-slim black and silver frame wrapped around the 55MU9000’s curved screen sets a promisingly high-end tone, and the metallic, roughly crescent-shaped desktop stand creates an airy, floaty look, it’s not out-and-out gorgeous. Nor is it particularly hefty, courtesy of that desktop stand’s general lightweight build. The curved panel can cause image foreshortening if watched from an angle, and make onscreen reflections (from, say, a table lamp) distort across more of the screen. It does, though, enhance the TV’s aesthetic appeal to a degree, and can make your viewing experience feel a little more immersive if you’re sat in the TV’s fairly small visual ‘sweet spot’. The flat MU8000 series is where those unsure about the curve should look. A good way to report on the TV’s screen technology is to combine it with an assessment of its performance. For instance, the appearance during some content of backlight clouding and jetting from the 55MU9000’s top and bottom edges alerts you right away to its use of an edge-mounted LED illumination system. This clouding reveals how the TV lights its pictures, but it’s not exactly a desirable picture trait. It draws your eye away from what you’re supposed to be watching. I found it a distraction during the big night-time scrap between the feuding superheroes in Batman v Superman (Ultra HD Blu-ray). The clouding during HDR playback can also hide shadow detailing in areas where it appears, as well as slightly muting colour tones. To limit these backlight issues, I knocked the TV’s Local Dimming and Contrast Enhancer settings to Low. However, this causes skies and walls behind Bats and Supes to lose some of their detail, and reduces brightness enough to impact the TV’s sense of dynamism. Buyers will probably find they need to set up one picture preset for daytime viewing – when the backlight clouding is less obvious and you need the extra brightness – and one for dark-room viewing where minimising clouding is your main focus. This doesn’t alter the fact that in an ideal world you’d be able to enjoy a punchier image in dark-room conditions without having to worry so much. And if you have a large family or awkwardly shaped room, you should note that the 55MU9000’s black level performance drops off fast if you watch the screen from angles any greater than 30 degrees off axis. This Samsung and I haven’t got off on the right foot, but overall it’s far from a poor TV. It has brightness and colour impact in spades. A measured peak luminance of around 700 nits falls short of the near 2,000 nits offered by Samsung’s flagship QLED, but it’s still a healthy figure, and ahead of much of the competition at this price. Brightness drops to below 600 nits if you turn down the local dimming from ‘high’ to hide those aforementioned backlight clouding issues, but you’ll only need to do this in a dark room, and just under 600 nits is still enough to give you an enjoyable HDR effect. plenty of minute variations in the Man of Steel’s costume. Colour vibrancy doesn’t give way to unsubtle shading. Blues, reds and greens retain their natural feel even in quite dark scenes. The 55MU9000 doesn’t have the brightness or colour range to match the stellar colour volumes Samsung’s QLED TVs can manage. Nor is it immune to the (very) occasional appearance of quite noticeable colour striping in some areas of exceptionally subtle blends, such as the white skies above Leonardo DiCaprio during the fade-to-black at the end of The Revenant’s opening ‘memory montage’ (Ultra HD Blu-ray). For its money, though, and for the vast majority of the time, this Samsung’s colours are exemplary. And this remains true regardless of whether you’re watching HDR or standard dynamic range content. I can only judge this based on the industry standard HDR 10 or HLG HDR formats; Dolby Vision is not supported. You can watch SDR material – most of your Blu-ray library, for example – in native form or using Samsung’s HDR+ emulation system. Purists will no doubt stick with the original format, but I’d argue that HDR+ is worth a try. It can cause a few noticeable backlighting blooms and occasionally goes too far in its search for peaky highlights, but it’s better than most, if not all, of the rival HDR engines I’ve so far played with. Sharpness with native 4K material is appreciable. HD Blu-rays enjoy a very clear detail enhancement after going through Samsung’s processors, yet this is added while simultaneously suppressing source noise and keeping a lid on upscaling issues such as haloing around object edges, or thickened line details. Just steer clear of low-bitrate SD broadcasts if you can. When there’s motion or a camera pan in the image, clarity retention is aided by setting the TV’s motion processing to its Custom mode, and assigning values of around three each to judder and blur. Samsung has been a smart TV pioneer for years, and this model still waves the flag. Its latest ‘Eden 2.0′ smart engine carries a large number of apps and streaming services, including 4K/HDR versions of Netflix and Amazon, as well as catch up services for BBC, ITV, Channel 4 and Channel 5. Navigation to your favourite sources is made easy by a responsive, compact home menu comprising two layers of icons, along with an efficient voice control system activated via the secondary ‘smart’ remote. Wi-Fi, Bluetooth audio, USB and Ethernet are all content sharing options – the latter two found on Samsung’s typical external One Connect box, which also houses a quartet of HDMI inputs, RF input, etc. The 55MU9000 doesn’t offer an integrated soundbar, or direct forward-firing speakers. Perhaps thanks to the extra bodywork opened up by its curved design, though, it delivers a slightly above average sound performance. Batman v Superman’s dense mix benefits from a credible mid-range, and proffers decent amounts of treble detail without brashness. The set doesn’t get close to mining the huge bass lows that litter the soundtrack, though. Samsung’s pursuit of HDR-friendly brightness mostly impresses even without QLED technology to help. But fans of dark room-viewing may struggle to ignore a few backlight woes. This single-enclosure soundbar ditches the sub in favour of a nine-driver three-channel array bolstered by Distortion Cancelling DSP. 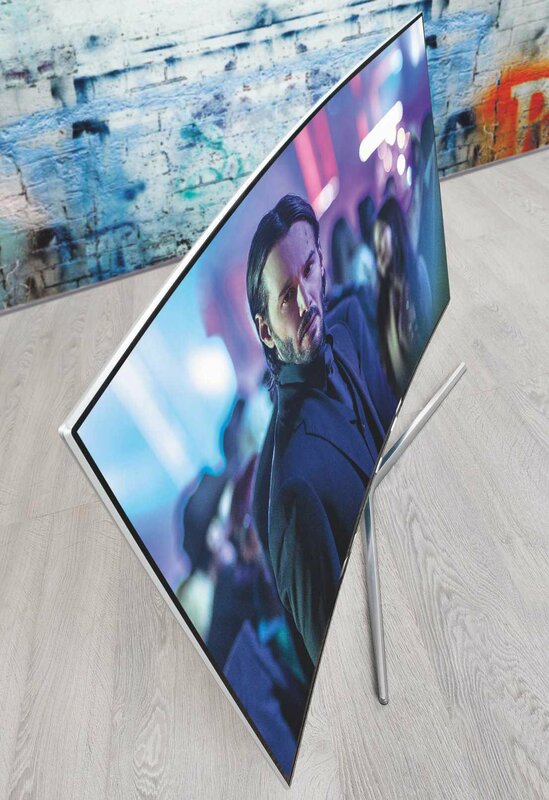 £600, and designed to be a style match for curved TVs. See p58 for more.